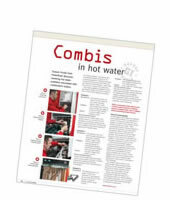 Hard water contains calcium and magnesium ions and when hard water is heated these salts form as hard scale inside hot water appliances and adjoining pipe-work. The build up of scale will continue as more and more calcium is deposited and will this lead to blocked hot water heat exchangers in Combination Boilers. Connect Powerflush machine to the combination boiler mains inlet and hot outlet. Add Descaler chemicals to Powerflush machine tank and circulate through the boiler. 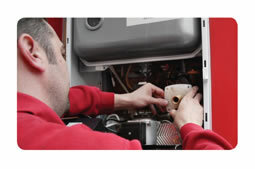 Boiler fires heating descaling chemical and the flow direction is repeatedly changed to maximize cleaning action. The blockage (lime scale) dissolves and produces CO2 which appears as foamy bubbles in the Powerflush machine tank therefore when no further CO2 is produced the Lime scale has been removed. To remove existing scale from your hot water system and prevent further build up we can fit a compact, Electronic Water Descaler Device. The Electronic Descaler creates a magnetic field in the pipe where it is fitted. As the Calcium ions pass through this field the Ions become charged and repell each other. As the Ions no longer clump together they do not become deposited on heat exchanger and pipework surfaces.